Sigh, it never gets any easier to choose our Featured Stamper every week. You ladies rocked this challenge again! And you made me WORK for this, LOL! Back and forth, making my lists, checking and rechecking. Finally I had to choose ONE of your cards and this was it. Doesn't this card just make you SMILE?! And make you want to be out there playing in the water with these kids? I love that Nicole used a stair step card for this--it shows great dimension and paints a sweet little scene. Nicole, you're our Featured Stamper this week! Congratulations! Now you're in the running for Guest Designer for August, so if you'll shoot me an email, I'll send you the blinkie to put on your blog. My email address is on my blog. Again, thanks to everyone for playing along with us this week--we hope to see you around here often. Be sure to check out tomorrow's challenge. Danielle has some really great colors picked for us! Thanks for making my day!!!! Congratulations, Nicole! Your card really caught my eye this week! Congrats Nicole ... what an awesome creation!! 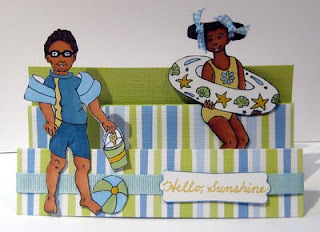 The Color Throwdown Challenge Blog is solely a paper crafting challenge blog. We are non-profit and do not make use of any personal information shared by the InLinkz tool, in any comments, blog hosts (Blogger/Google), or any third-party applications such as email subscription services. Your entry in the challenge gives consent to have your name and blog link visible in the entries. By commenting, you are likewise giving consent for your name and/or a link to your Blogger profile being visible. If you are a winner or a weekly favorite, your entry is consent for a copy of your entry to be displayed in the Featured Stamper announcement post along with your name as it is entered in the challenge, as well as the Color Throwdown Instagram, Facebook, and Twitter feeds. Blog links will no longer be published as part of the announcement. This blog contains links to other websites. If you choose to click on one of these links, you will be directed to that website. These websites may place their own cookies or otherwise collect data from you. You are encouraged to read the privacy policies or statements of the other websites you visit. 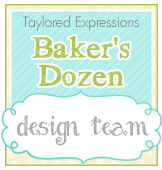 Were you chosen as a Featured Stamper? PLEASE NOTE: We do not accept sponsorships for our challenge. Thank you for understanding. Get a sneak peek of the upcoming color swatch after 4:00 p.m. Tuesday by following us on Facebook! The Color Throwdown challenges are intended to be fun for everyone. Please use whatever colors you have on hand that are most similar. Combining challenges is fine, but entries must be a new creation, and the colors of your creation should primarily consist of only the Throwdown colors. Neutrals (black, gray, white, Kraft, cream, brown) are free, so use them as you need to complete your design; however, if they are included in the challenge palette they must be used in your creation. We also appreciate a link back to The Color Throwdown site whether you are posting to your blog or another forum. A direct link to your card via Inlinkz is required. General blog links or cards not following the challenge colors could be deleted. No digital projects--only digital images that are printed off and colored will be allowed. Links must be in place by 6:00 p.m. EST on the Monday immediately following each week's challenge to be considered for Featured Stamper. Thank you for playing!